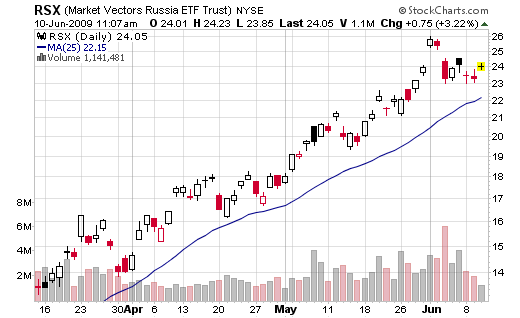 This month’s best performing ETF is Market Vectors Russia (symbol RSX). The Russian stock market, like most emerging markets, is recovering from huge losses suffered during 2008 and the first part of this year. If the actual rally persists, this ETF should continue to perform well; however, it will give back its earnings very fast should the bear market mood return. Remember, you should have a well-defined exit strategy in place before buying any ETF or any other investment vehicle, by the way. Is this ETF worth buying right now? Find out what the best performing ETFs are right now and how you can improve your portfolio return. Click here to find more! What Do These 8 Technical Indicators Mean for the Markets? admin: Tim, if you have to use stops is better to use mental not hard stops. admin: George, you should use stop loss or have a well defined exit strategy.